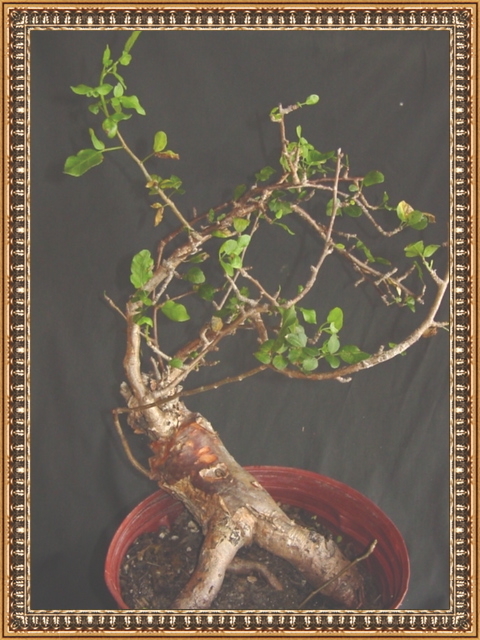 specializes in and offers a select group of unique and unusual bonsai-able tree forms that grow indoors with natural or artificial light and a minimum of 60 degrees Fahrenheit. These plants are considered to be rare - not typically found in your local nursery. The majority of our plants are greenhouse grown from seed and vary in size as indicated: S = small (3" pot), M = medium (4" pot), L = large (6" pot), XL = extra large (10" pot), SP = specimens. We do have seedlings of most varieties listed, however, we prefer to offer you a more established plant. If interested, please inquire. Please note: We sell our plants primarily by their interesting shapes - we prune them, trim their roots and often replace them in their original pots, so the size of the pot is not a strict guideline. Our plants are shipped bare root, as is typical, unless otherwise indicated, so understand that there may be some defoliation and shock until the plant is re-situated, which should be as soon as possible, especially in the winter. If you are interested in a plant that we are not offering, let us know - we may be able to locate it for you. Shipping: We ship year round - weather permitting (or at purchaser's risk). We will ship your plants within 2 weeks of receipt of your order. Please indicate your desire regarding substitutes, if necessary. No shipping outside the U.S.A. Minimum order is $25.00 - check or money order only - must accompany all orders. We are proud of the quality of our plants, however, if you are not satisfied, you may return the plant(s) within 5 days of your receipt for a replacement or refund. Photographs will be made available to you at your request - serious buyers only, please. Also, if you would like a catalog (text only) sent to you, please send $1.00. If you have any questions, feel free to call us or fax us between the hours of 12 noon and 8 p.m. Pacific time. You may visit us, by appointment only, with a minimum purchase of $25.00. An order form is provided for printing out and mailing.